Conditions will be broadcast once, and then the broadcast stream will go quiet until there is an update to an advisory near you; or you have come within range of another advisory; or a set time period has elapsed (that you choose) and you want to re-hear all advisories that are still in range. 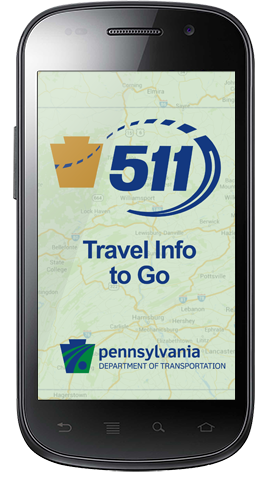 While the app has additional features in the "More Features" section, PennDOT reminds motorists to not interact with the app while driving. What happens if I get a phone call while using 511PA Mobile App. If you get a call, or make a call while a travel alert is playing, the alert will pause, and will resume playing when the call has ended. You can select to hear advisories while you are on and active call, provided that you have a data plan that permits simultaneous data and talk.